Comprehensive treatment of periodontitis is very different from the treatment of most bacterial infections. While periodontitis is traditionally considered a bacterial infection, many variables influence treatment outcomes. The reduction of the probing depth of the periodontal pockets is one of the main criteria for the success of the periodontal treatment. The prevalence of the residual pockets with probing depth greater than 4 mm determines the risk of disease progression. The reduction of the periodontal sites with PD above 7mm with non-surgical periodontal treatment could limit the necessity of periodontal surgery. 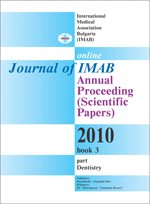 Aim: Evaluation of the effectiveness of treatment of severe chronic periodontitis with additional target antibiotic administration in comparison with the therapy with adjunctive antimicrobial combination amoxicillin+metronidazole and conventional mechanical periodontal treatment regarding the prevalence and the achieved mean reduction of PD of periodontal pockets with initial PPD below 3mm, from 3 to 5mm, from 5-7mm and above 7mm. Results: In all study groups a reduction of the mean PD has been achieved. The prevalence of periodontal sites with PD above 7mm after therapy is the lowest in the group with target antibiotic administration. These results advocate the effectiveness of the target adjunctive antimicrobial treatment in order to limit the extent of the surgical procedures in the therapy of the periodontal disease. Key words: periodontitis, adjunctive antibiotic therapy, target antibiotic administration, PPD reduction, long-term maintenance.